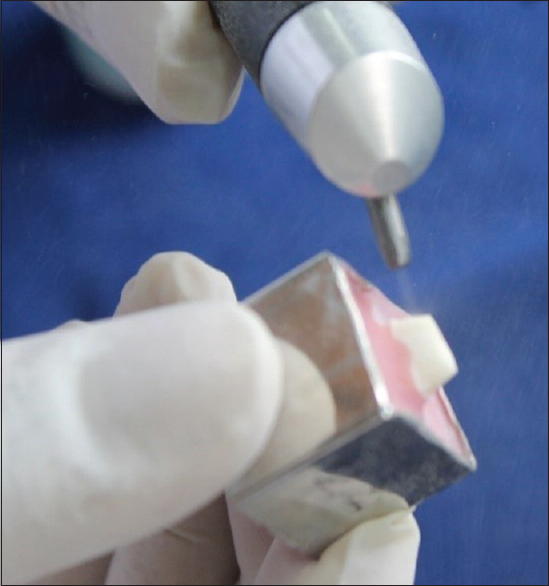 Aim and Objectives: The purpose of this study was to investigate the effect of dentin surface treatment with aluminum oxide air abrasion and Er:YAG laser on tensile bond strength of metal crowns. Metal crowns were luted with conventional glass ionomer cement (GIC) in the teeth with reduced crown height, where preparation geometry did not provide optimal retention form. Materials and Methods: Forty-eight human premolars were prepared to receive metal crowns and were randomly divided into four groups for tensile bond strength testing. Group A: Untreated dentin luted with self-adhesive composite resin cement as positive control; Group B: Untreated dentin luted with GIC as negative control; Group C: Surface treatment with 50 μm aluminum oxide air abrasion and luted with GIC; Group D: Surface treatment with Er:YAG laser (λ =2.94 mm) with a total energy 84.88 J/cm2 of (60 mJ/pulse, 10 Hz, 60 pulses, and 100 μs pulse width) and luted with GIC. The cemented specimens were thermocycled and later subjected to axial load in a universal testing machine at 0.5 mm/min cross-head speed for tensile testing. Scanning electron microscopic evaluation of dentin surface treatment and cement–dentin interface was also done in representative specimens. Results: One-way analysis of variance showed statistically significant difference among/within the groups (P < 0.001). Tukey's post hoc test presented significant increased tensile bond strength of Er:YAG laser group. Air abrasion group showed no significant increase in tensile bond strength values (P = 0.033). Conclusion: Dentin surface treatment with Er:YAG laser significantly improved the tensile bond strength of luting GIC compared to air-abraded and untreated dentin. Replacement of missing teeth with a fixed dental prosthesis (FDP) has remained a viable alternative over centuries. Success of any FDP depends primarily on the tooth preparation with optimum retention and resistance form. Teeth with reduced crown height due to attrition, tooth malformation, or genetic factors often have compromised retention and resistance form after tooth preparation. Cementation of the crown is an important step for the longevity of any restoration and becomes even more important when prepared tooth geometry does not favor the optimum retention and resistance form. The clinical success of FDP is heavily dependent on the selection of cement and cementation procedure. The attachment of a dental cement may be mechanical, chemical, or combined action of both methods. Ayad et al. reported a significant correlation between the area of dentin available for bonding and retention of the prosthetic crown and concluded that the surface roughness of prepared teeth encouraged mechanical interlocking of cement to the tooth surface, which enhanced the retention and reduced the need for additional retentive measures. Glass ionomer cement (GIC) is a commonly used luting cement with physicochemical bonding and still remains a feasible choice for vital teeth because of its ability to resist caries due to fluoride release, minimal effect on the pulp, and low coefficient of thermal expansion. Tuntiprawon reported that increased tooth surface roughness positively influenced the bond strength of metal crowns luted with GIC. According to him, chemical and mechanical bonding of GIC was heavily dependent on the condition of prepared tooth surface. The role of aluminum oxide particle air abrasion and Er:YAG laser has been highlighted in many studies. These methods modify the surface topography and remove smear layer from the prepared tooth surface., Composite resin and resin-modified GIC luting agents have already shown favorable results after undergoing these dentin surface treatments., Altunsoy et al. concluded that Er:YAG laser was effective in improving the shear and microtensile bond strength of resin-modified GIC. Another recent study done by Aljdaimi et al. also proved that laser etching of dentin leads to better restorative shear bond strength. The comprehensive review of literature reveals very limited research on metal crowns luted with conventional GIC after the surface treatment of prepared dentin. The setting and bonding mechanism of GIC is also different than resin-based cement. Therefore, this study was planned to assess the effect of aluminum oxide particle air abrasion and Er:YAG laser irradiation treatment on the dentin surface. The aim of this study was to evaluate the effect of dentin surface treatment with aluminum oxide air abrasion and Er:YAG laser irradiation on the tensile bond strength of metal crowns luted with GIC in teeth with reduced crown height. Morphological evaluations of untreated dentin, surface-treated dentin, and cement–dentin interface of the representative specimens were also carried out by scanning electron microscope (SEM). The null hypothesis stated that there exists no difference in tensile bond strength of complete coverage metal crowns luted with GIC on untreated dentin surface, aluminum oxide particle air abrasion-treated dentin surface, and Er:YAG laser-treated dentin surface. An approval to conduct the study was obtained from the institutional ethical committee with approval no. SVIEC/ON/DENT/BNPG-14/D15009. From a previous study done by Kobayashi et al. in 2003 and assuming the bond strength of metal crowns among planned groups with the mean difference of 5.107 with standard deviation (SD) of 3, a power of 90%, and confidence interval of 99% and by applying the following formula: N = Z2/(effect size) 2 (where effect size = 1.703), a sample size per group of 10 samples was derived. By considering a 20% chance of error in processing of specimens, a sample size of 40 + 8 = 48 (12 per group) was kept. Another six specimens were prepared separately for SEM evaluation of untreated prepared dentin, air-abraded dentin, and Er:YAG laser-irradiated dentin. A total of 54 (48 + 6) noncarious, nonrestored premolars of similar crown size, extracted for periodontal and orthodontic causes, were collected and stored in normal saline at room temperature in a sterile-sealed bottle. Calculus and debris were removed from the teeth by ultrasonic cleaning, and then, they were sterilized in autoclave in compliance with the recommendations of the Centers for Disease Control to avoid cross-contamination. Occlusal surface of the extracted teeth was ground flat and roots were notched with rotating disc on a slow-speed handpiece. Teeth were embedded with the help of dental surveyor (Marathon–103, Saeyang Company) in the stainless steel molds in such a way that coronal portion of each tooth remained 2 mm above the cementoenamel junction and care was taken to keep the occlusal surface parallel to the horizontal plane. 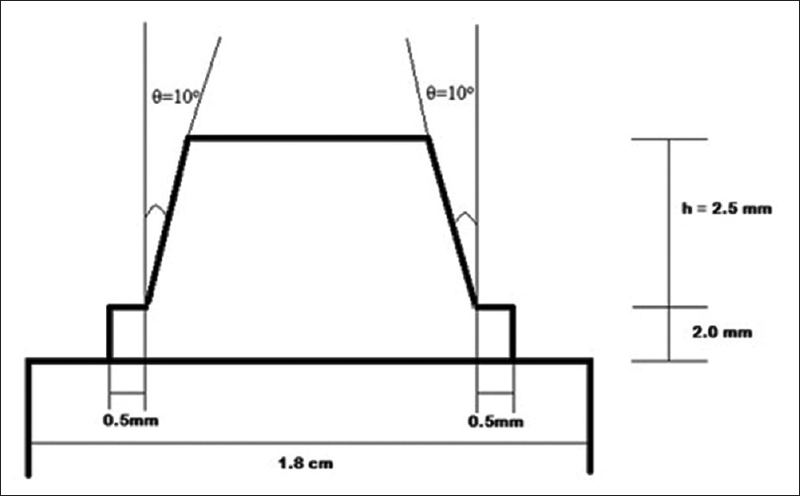 A high-speed dental handpiece was positioned in a custom-made attachment in such a way that the bur was oriented at an angle of 10° to create convergence angle of 20°. A flat end diamond bur with parallel sides was used to prepare axial walls under 25 ml/min water flow. The axial height of each specimen was kept 2.5 mm to simulate reduced crown height condition and 0.5-mm thick shoulder margin was prepared all around the surface [Figure 1]. Impression of each prepared specimen was made in a custom tray made from autopolymerized resin. Impressions were made by two-step impression technique using soft putty and light body consistencies of addition silicon vinyl polysiloxane impression material (Lot No: ZP0011032, 624739, Express™ XT, 3M ESPE, Germany) for all specimens and poured into type IV gypsum die stone (Uni-base 300, Dentona) to prepare dies. Measurement of total prepared surface area for cementation was essential to measure tensile strength in standardized Mega Pascal (MPa) unit. Therefore, all prepared dies were scanned in a laboratory CAD/CAM scanner (AutoScan DS 100+) and three-dimensional (3D) scanned images were obtained in.STL file format. Image of each die was processed in the Geomagic Studio software with Geomagic Control tools: Version 2014 (Geomagic, Morrisville, NC, USA) and the prepared surface area was calculated on the 3D model with ±10 μm accuracy. Wax patterns were fabricated on dies with type II inlay pattern wax using dip-in method to achieve even thickness on all specimens. A wax loop was attached in the center on the occlusal surface of wax pattern exactly perpendicular to the base to allow tensile bond strength testing. Parallel positioning of wax loop was verified by analyzing rod attached to the vertical arm of the dental surveyor. The conventional casting technique was used to cast Ni-Cr alloy crowns (Dentsply International, USA). Internal surface of all prepared crowns were sandblasted with 50 μ aluminum oxide sand. All the crowns were later checked for marginal accuracy on the prepared teeth by impression replica technique using light bodied vinyl polysiloxane impression material. The marginal gap for all crowns was assessed in stereomicroscope (Motic, Hong Kong) under ×10 magnification. The captured images of margins of each crown were analyzed in Motic Image plus, Version 2.0 (Motic®, Hong Kong) image analyzing software. Crowns with marginal gap of <100 μm (clinically acceptable marginal gap) were considered acceptable for further procedure. Crowns with marginal gap beyond 100 μm were rejected for the study and fabricated again by the same process. The specimens were randomly divided into four test groups according to computer-generated random sequence from https://www.random.org/sequences/[Table 1]. 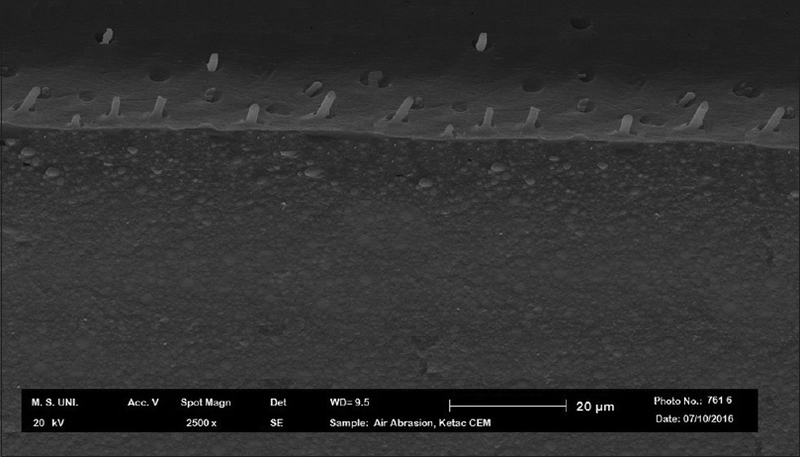 Dentin surface was air abraded using a MicroJato intraoral microblaster (Bio-art Equipamentos Odontologicos Ltd., Brazil), with aluminum oxide particles of 50 μm under 60 psi pressure and delivered by a 0.46 mm diameter and 60° angulated tip [Figure 2]. Jet intensity was kept 5 g/min, applied at a focal distance of 5 mm with a 45° angle to the tooth surface to avoid particle reflection. Air abrasion was followed by rinsing with water for 40 s.
Dentin surface was treated with Er:YAG laser from Fotona Fidelis III (Fotona d.o.o., Slovenia, EU) of 0.3 mm focus beam at 60 mJ energy, 84.88 J/cm2 energy density, and repetition rate of 10 Hz at very short pulse duration of 100 μs. R14-C handpiece in noncontact mode at a working distance of 2 mm from the dentin surface was used. A cylindrical fiber optic tip with 0.3 mm diameter and 20 mm length of R14-C handpiece: PRECISO 300/20: Cylindrical (Code: 83890) (Fotona d.o.o., Slovenia, EU) was used to irradiate the tooth surface [Figure 3]. The standard distance was maintained by attaching laser handpiece in a customized attachment of dental surveyor. The laser beam was directed perpendicular to the tooth surface. The surface was irrigated under constant air and water mist of 10 ml/min during irradiation. Specimens from Group A were cemented with self-cured composite resin luting cement RelyX™ U200 (Lot No. : 626726, 3M ESPE, Germany) and specimens from Groups B, C, and D were cemented with luting GIC Ketac™ Cem radiopaque (Lot No: 631789, 3M ESPE, Germany) using standard protocols and manufacturer's recommendations. Initially, crowns were seated with firm digital pressure and then subjected to an axial force of 5 kg for 10 min in a loading device. After complete setting, all cemented specimens were kept in distilled water at room temperature for about 24 h. Specimens were later subjected to thermocycling at 5°C–55°C for 5000 cycles, with a dwell time of 30 s to simulate temperature changes of oral environment. After thermocycling process, crowns were subjected to an axial dislodgement force until failure occurs on a universal testing machine (Instron, Model No: 3300). The cross-head speed was set at 0.5 mm/min. The maximum force required for dislodgement was recorded in Newton (N). Measured force for dislodgement in Newton (N) was divided by previously measured total bonding surface area for cementation in mm2 to obtain tensile bond strength values in Mega Pascal (MPa) for each specimen. The internal surfaces of the separated crowns and tooth surface were later examined under magnifying glass to determine the mode of cement failure. The mode of failures were categorized into the following four categories [Table 2]. Morphological analysis of untreated dentin, aluminum oxide particle air-abraded dentin, and Er:YAG laser-irradiated dentin was done under SEM in separately prepared six specimens. After tensile bond strength testing, two random specimens from all four groups were also subjected to SEM evaluation to assess morphological evaluation of cement–dentin interface. Scanning of the surfaces was done under ×2500 in SEM: Hitachi S-4700 FE-SEM Field Emission SEM (Hitachi High Technologies, Japan). Mean and SD were calculated for each group. The data were analyzed with Statistical Package for the Social Sciences Version 20.1 (IBM Corp. Chicago, USA) software for descriptive and analytical statistics. The parametric one-way analysis of variance (ANOVA) test was used to check differences in mean scores between groups, and pairwise comparison was done using Tukey's honestly significant difference (HSD) post hoc test. Level of significance was set at P < 0.001. The mean and SD tensile bond strength values of the four groups are presented in [Table 3]. According to the results of one-way ANOVA, a significant difference was found in the mean tensile bond strength values (P < 0.0001) for all the four groups [Table 4]. Self-cured composite resin cement group (Group A: positive control) showed maximum tensile bond strength while GIC group without any dentin surface treatment (Group B: negative control) showed minimum tensile bond strength. Tukey's HSD post hoc test [Table 5] showed statistically significant improvement in tensile bond strength of GIC after dentin surface treatment with Er:YAG laser irradiation (Group D) (P < 0.001) while aluminum oxide air abrasion showed no statistically significant improvement in tensile bond strength of GIC (Group C) (P = 0.033). 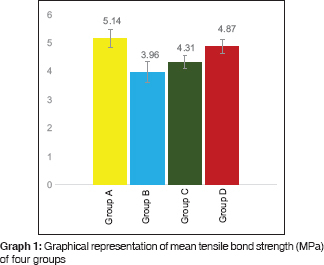 Graphical representation of mean tensile bond strength of four groups is shown in [Graph 1]. After tensile bond strength testing, all the specimens were evaluated for the modes of failure which are presented in [Table 6]. 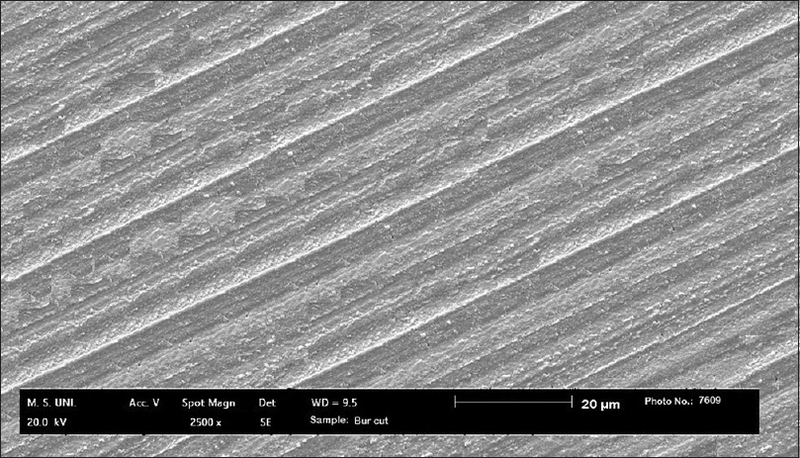 The SEM image of dentin surface without any surface treatment showed a relatively flat topography. 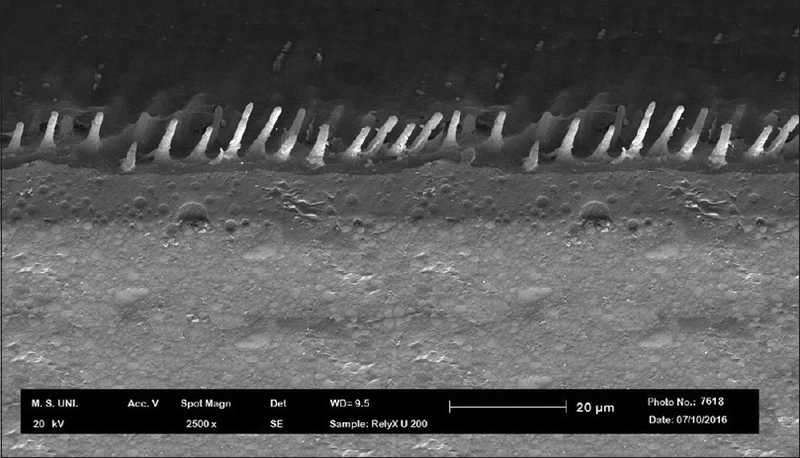 Dentin surface showed track lines formation due to the use of rotary burs and the presence of large amount of loosely attached smear layer on dentin. Dentinal tubules were completely occluded by smear layer [Figure 4]. 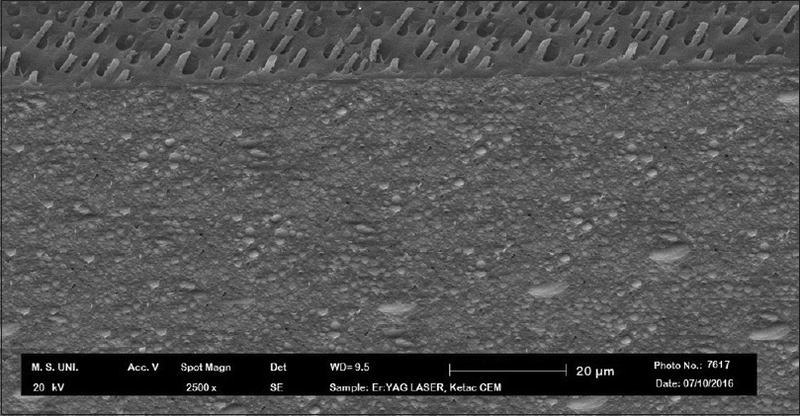 The SEM image after the application of 50 μm aluminum oxide air abrasion showed microscopically visible irregularities with cracks, surface roughness, partial removal of smear layer, and some amount of opened dentinal tubules [Figure 5]. Er:YAG laser-irradiated dentin showed extensive surface roughening, absence of a smear layer along with opened dentinal tubules. It also showed more ablation of intertubular dentin than peritubular dentin [Figure 6]. 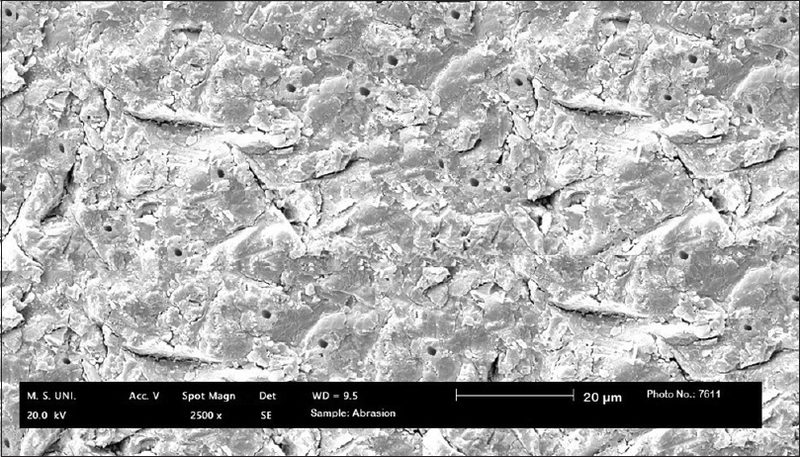 SEM evaluation of cement–dentin interface of representative specimens of Group A showed resin tags had well penetrated the dentinal tubules. The resin tags were significantly similar in size all over the surface and exhibited cylindrical shape [Figure 7]. Group B showed no penetration of cement into the dentinal tubules and presence of a smear layer [Figure 8]. Group C showed less penetration of cement tags into dentinal tubules which were not uniform in nature, size, and shape. A few dentinal tubules were also seen without cement penetration [Figure 9]. Group D cement–dentin interface showed acceptable penetration of cement into dentinal tubules all over the surface [Figure 10]. The results of this study rejected the null hypothesis as dentin surface treatment with Er:YAG laser significantly increased the tensile bond strength of GIC. However, the dentin surface treatment by aluminum oxide air abrasion did not improve the tensile bond strength of GIC. In this study, dentin surface treatment with Er:YAG laser irradiation showed a statistically significant improvement in tensile bond strength of GIC, which was comparable to the bond strength of positive control group of self-cured composite resin cement (RelyX U200). The reason of increase in tensile bond strength values in Er:YAG laser group may be because of effective removal of smear layer from the prepared tooth surface and opening of dentinal tubules orifices after laser irradiation. 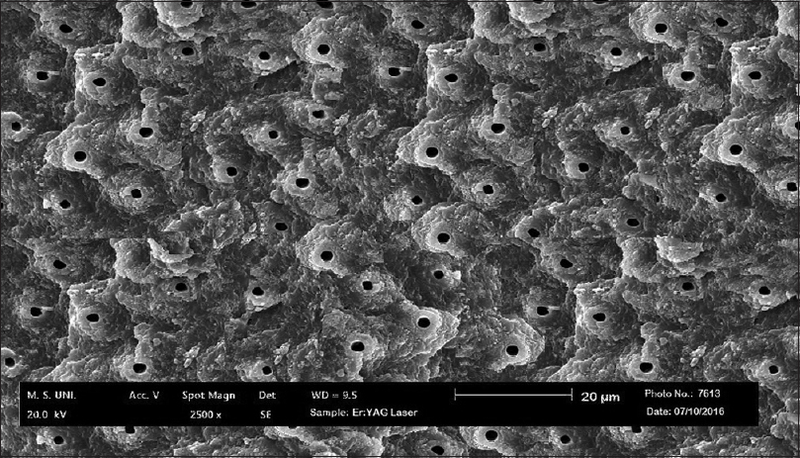 Previously done studies have proved that the treatment with laser results in an anfractuous surface (fractured and uneven) which leads to better bonding of cement.,, SEM evaluation of representative specimens of Er:YAG laser-irradiated dentin in this study also demonstrated the complete removal of smear layer and opened dentinal tubules orifices. Similar findings were also observed in the study carried out by Hossain et al. Dentin surface treatment with aluminum oxide air abrasion assessed in this study did not show a statistically significant improvement in tensile bond strength of GIC. SEM evaluation of representative specimens also showed partial removal of smear layer and few open dentinal tubules with surface roughness. According to Parab and Ram, aluminum oxide air abrasion acts on the surface of hard dental tissues by emission of particles under high pressure, not selectively removing the organic and inorganic portions of the substrate. This leads to the formation of a characteristic layer on the tooth surface which consists of dental hard tissue and aluminum oxide particles. This may be the possible reason for no improvement seen in tensile bond strength of GIC after dentin surface treatment with air abrasion in this study. 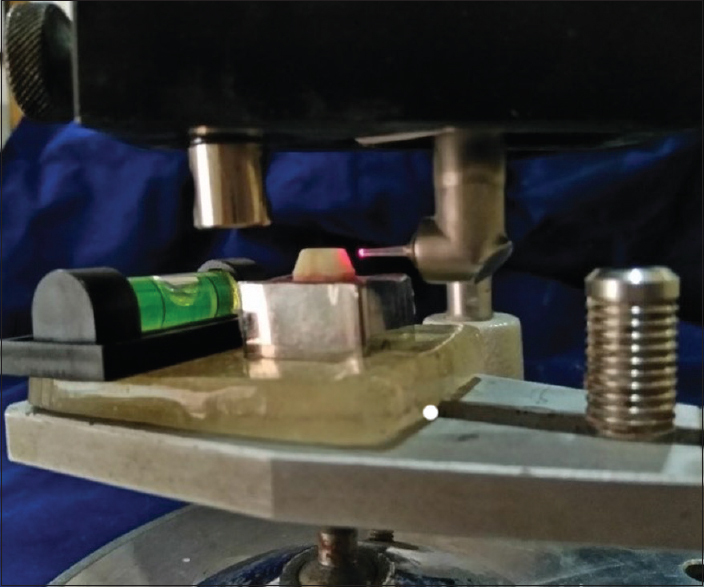 In this study, types of failures were also assessed after tensile bond strength testing. Specimens of Er:YAG laser-treated group showed mostly the cohesive type of failure (58.33%) which also suggests that bonding of cement to the laser treated dentin may be satisfactory, because of which the cement remained attached to the tooth. According to Jiang et al., cohesive failure mostly suggests that the bond to the tooth is stronger than the cohesive strength of the cement. A systematic review by Ng et al. in 2007 showed 68%–85% success rate of primary root canal treatments. Thus, necessity of re-root canal treatment cannot be ruled out during the life span of the patient, which may require retrieval of the cemented crown. However, in clinical scenario, if crown requires removal, high retentive strength of resin-based luting cements may be sometimes detrimental to healthy tooth structure. Thus, if favorable retention is achieved even with conventional GIC after laser surface treatment, it may be quite advantageous. This study was conducted on crowns with reduced clinical height to simulate a clinical scenario which clinicians encounter most often in day-to-day practice. It also compared the conventional GIC after laser surface treatment with gold standard resin-based cement. The difference between two groups came nonsignificant; thus, the results may be applied by further testing other parameters inin vitro andin vivo setups. Various authors have also suggested the potential of Er:YAG laser in reduction of postoperative sensitivity., Thus, laser surface treatment with various luting cements in clinical situations of vital abutments can be applied after further research on teeth sensitivity aspects. Future studies on a larger number of SEM specimens can also be conducted to comprehensively investigate the cement–dentin interface. Research may also be undertaken using a combination of various dentin surface treatments. There are a few limitations of this in vitro study. The SEM evaluation done in this study to confirm the results of tensile bond strength testing was on limited specimens only. Intrapulpal temperature changes due to Er:YAG laser irradiation was also not assessed in this study. The results obtained from this study are from standardized tooth preparation and in ideal experimental conditions. Variations in results might be possible in clinical setups, where the tooth preparation cannot be controlled precisely by clinicians due to clinical restraints. Within the limitations of this in vitro study, the dentin surface treatment with Er:YAG laser significantly improved the tensile bond strength of luting GIC as compared to untreated dentin and air-abraded dentin. We would like to thank Dr. Anil Shah (Innovate Dental Center, Surat, India) for providing the facility of Er:YAG laser in this study. Rosenstiel S, Stephen F, Land MF, Fujimoto J. Contemporary Fixed Prosthodontics. St. Louis, Mo. : Mosby Elsevier; 2006. Diaz-Arnold AM, Vargas MA, Haselton DR. Current status of luting agents for fixed prosthodontics. J Prosthet Dent 1999;81:135-41. Ayad MF, Rosenstiel SF, Hassan MM. Surface roughness of dentin after tooth preparation with different rotary instrumentation. J Prosthet Dent 1996;75:122-8. Tuntiprawon M. Effect of tooth surface roughness on marginal seating and retention of complete metal crowns. J Prosthet Dent 1999;81:142-7. Parab S, Ram SM. 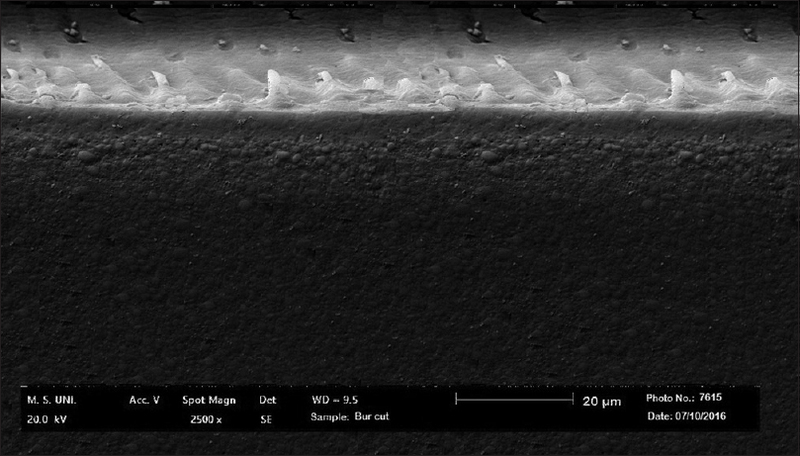 An evaluation of the surface condition of dentin and its effect on microleakage of metal copings luted with glass ionomer cement: An in vitro study. Int J Laser Dent 2012;2:7-17. Chiniforush N, Nokhbatolfoghahaei H, Monzavi A, Pordel E, Ashnagar S. Surface treatment by different parameters of erbium:Yttrium-aluminum-garnet (Er:YAG) laser: Scanning electron microscope (SEM) evaluation. J Lasers Med Sci 2016;7:37-9. Russo DS, Buti J, Giachetti L. An in vitro comparison of bonding effectiveness of different adhesive strategies on erbium: Yttrium-alluminum-garnet laser irradiated dentin. Open J Stomatol 2016;6:1. Mujdeci A, Gokay O. The effect of airborne-particle abrasion on the shear bond strength of four restorative materials to enamel and dentin. J Prosthet Dent 2004;92:245-9. Altunsoy M, Botsali MS, Korkut E, Kucukyilmaz E, Sener Y. Effect of different surface treatments on the shear and microtensile bond strength of resin-modified glass ionomer cement to dentin. Acta Odontol Scand 2014;72:874-9. Aljdaimi A, Devlin H, Dickinson M. Effect of the Er:YAG laser on the shear bond strength of conventional glass ionomer and biodentine™ to dentine. Eur J Dent 2018;12:380-5. Kobayashi CA, Fujishima A, Miyazaki T, Kimura Y, Matsumoto K, Osada T, et al. Effect of Nd:YAG laser irradiation on shear bond strength of glass-lonomer luting cement to dentin surface. Int J Prosthodont 2003;16:493-8. Kohn WG, Collins AS, Cleveland JL, Harte JA, Eklund KJ, Malvitz DM. Guidelines for infection control in dental health-care settings–2003. MMWR Recomm Rep 2003;52:1-61. Ayad MF, Rosenstiel SF, Salama M. Influence of tooth surface roughness and type of cement on retention of complete cast crowns. J Prosthet Dent 1997;77:116-21. Zhou Q, Wang Z, Chen J, Song J, Chen L, Lu Y. Development and evaluation of a digital dental modeling method based on grating projection and reverse engineering software. J Prosthet Dent 2016;115:42-6. Falk A, Vult von Steyern P, Fransson H, Thorén MM. Reliability of the impression replica technique. Int J Prosthodont 2015;28:179-80. Martins LM, Lorenzoni FC, Melo AO, Silva LM, Oliveira JL, Oliveira PC, et al. Internal fit of two all-ceramic systems and metal-ceramic crowns. J Appl Oral Sci 2012;20:235-40. Chimello DT, Ramos RP, Chinelatti MA, Dibb RG, Pecora JD, Corona SA. Effect of Er:YAG laser and air abrasion on the tensile bond strength of two adhesive restorative systems to dentin. J Oral Laser Appl 2002;2:223-9. Ergin S, Gemalmaz D. Retentive properties of five different luting cements on base and noble metal copings. J Prosthet Dent 2002;88:491-7. Johnson GH, Lepe X, Bales DJ. Crown retention with use of a 5% glutaraldehyde sealer on prepared dentin. J Prosthet Dent 1998;79:671-6. Delmé KI, De Moor RJ. A scanning electron microscopic comparison of different caries removal techniques for root caries treatment. J Oral Laser Appl 2003;3:235-42. Olivi G, Olivi M. Lasers in Restorative Dentistry. Berlin, Heidelberg: Springer; 2015. Dahiya A, Gandhi P, Baba NZ. Comparative evaluation of the effect of laser etching on the shear bond strength of crowns cemented with two different luting agents: An in vitro study. Int J Prosthodont 2017;30:485–486. Hossain M, Yamada Y, Nakamura Y, Murakami Y, Tamaki Y, Matsumoto K. A study on surface roughness and microleakage test in cavities prepared by Er:YAG laser irradiation and etched bur cavities. Lasers Med Sci 2003;18:25-31. Jiang QZ, Kong YY, Chen ML, Chen Y. The effects of Er:YAG laser treatment on the binding of glass ionomer cement to the prepared enamel. J Adhes Sci Technol 2014;28:1644-54. Ng YL, Mann V, Rahbaran S, Lewsey J, Gulabivala K. Outcome of primary root canal treatment: Systematic review of the literature – Part 1. Effects of study characteristics on probability of success. Int Endod J 2007;40:921-39. Asnaashari M, Moeini M. Effectiveness of lasers in the treatment of dentin hypersensitivity. J Lasers Med Sci 2013;4:1-7. Yu CH, Chang YC. Clinical efficacy of the Er:YAG laser treatment on hypersensitive dentin. J Formos Med Assoc 2014;113:388-91.